Modal Mania: Janette’s hosting a dinner party. She had better? 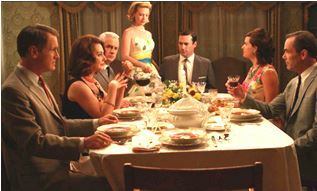 So, despite my inability and reluctance to turn on my cooker, I’ve decided to host a festive formal dinner party. With this in mind, I need to be reminded about the right way of doing things; the things that I am not supposed to do, and the things that I should or ought to do. I did check on the Internet but, holy smokes, people take this form of entertainment far too seriously! Seriously, it’s mental, there are even books written about it! You should check to see if any guests have a specific dietary requirement. SHOULD It’s a good thing to do. You ought not to invite a stripper for the evening’s entertainment. OUGHT NOT TO It’s not the right thing to do. You had better learn how to cook something because ordering a takeaway isn’t the right thing to do. HAD BETTER: It’s the best thing to do. You are not supposed to drink like a fish when you are the hostess. BE SUPPOSED TO. It’s not the right thing to do, but you probably will do it anyway. Disinvite gluten-free people, lactose-free people, people allergic to nuts, meat eaters, fish eaters, teetotallers, people who blog about food. Throw away packaging so nobody knows I spent an arm and a leg at El Piano buying homemade vegetarian takeaway food. Pour vodka into water bottles. Posted on Aug 10, 2017 Jul 22, 2017 by Inglés MálagaPosted in Grammar, Reading, VocabularyTagged advice, aprende ingles malaga, entertainment, Food, good idea, Modal Verb. Previous Previous post: Modal Mania: It’s an obligation Janette: You MUST, You HAVE TO. Hi, believe it or not, I had better not invite to dinner my friends because, surprinsingly, my living room is invaded by very, very older clocks of the 19th Century! There are on the tables, on the wall, on the shelves, exactly thirty-six clocks. All of them have an interesting story and work, but it had better not ring at the same time. Don’t worry, at midnight my husband must stop their pendulums. My living room is a museeum!! !